The Jedforest Instrumental Band Hosted the 13th annual Borders Entertainment Contest on Sat 2nd Nov in the Town Hall, Jedburgh. A total of 20 Bands entered from all over Scotland and North England and the contest was confined to the 2nd 3rd and 4th sections. Each band was asked to play 15mins worth of music with one of the pieces to be written or arranged by Gordon Langford. The Contest was won on the day by the Tullis Russell Mills Band from Fife conducted by Paul Drewry. Jedforest, conducted by Philip Rosier, came in 3rd overall but did manage to win the Entertainment prize for the most entertaining programme on the day. The host band opened their performance with the Jazz/Funk infused 'The dreaded groove and hook' by Simon Dobson. The band then showed off principle Trombone player Gordon Melrose with the wonderful Don Lusher solo 'Dark Eyes'. A change in style showed off the bands sound when they played the sonorous Organ and Vocal piece ' The Lost Chord' arr by Gordon Langford. The band then closed their set with a wonderful arrangement of the Elton John hit 'The Circle of Life' from the Lion King, with the vocals of the band impressing the judges just as much as the playing. To hear the bands performance along with adjudicator Philip Harpers live comments click here. The 13th annual Borders Entertainment Contest will this year be hosted by the Jedforest Instrumental Band on Saturday 2nd November, when the JIB will be amongst the 20 competitors that will battle it out for the Scottish Borders Trophy. The Scottish Borders Brass Band Association (SBBBA) is organising the exciting event, which will be held in the Jedburgh Town Hall, with the first band taking to the stage at around 9am and with the final performance around 6pm. As well as the JIB, other local Border bands such as Hawick, Langholm, Peebles, Selkirk and St. Ronan’s will battle against rivals from all over Scotland, with each competitor giving a 15 minute concert programme to try and tickle the fancy of judges. Association Chairman Alan Fernie added: "We are delighted with the fantastic entry of bands from all over Scotland. The contest promises to be a great day's entertainment in a first class hall and will bring many visitors to the region." All this and it only costs £5 for all day entry and U18s go free. So go along and enjoy a full day of brass band entertainment. Jedforest Instrumental Band will be leading a 'Songs of Praise' evening on the 20th of October in Kelso Old Parish Church at 6.30pm. The congregation will be led through a number of favourite hymns accompanied by the band. Come along to Kelso Old Parish Church this Sunday for a Songs of Praise with the Jedforest Instrumental Band. We'll be doing some of the greatest hymns ever written, with a mixture of old and new: Guide Me O Thou Great Redeemer, Thine Be the Glory, Praise My Soul, Love Divine, and lots more. The programme will also include, amongst others, the Benedictus from Karl Jenkins' "The Armed Man". Entry is free and the Band will be conducted by Cameron Mabon. The Jedforest Instrumental Band will be holding a concert in the Jedburgh Town Hall on Saturday 21st September. The Concert will include the Band Buddies as well as Abbey Brass. Playing the stunning but challenging peice 'The Plantaganets' by Edward Gregson, the band, playing of the no 4 draw, gave a solid but by no means error free performance of what was once a top section test peice. Huge praise has to go the soloists of Hamish McRichie, David Sutherland and Scott Renwick who all rose to the occasion and produced some fine playing. championship piece. It was a huge challenge to attempt with all it's difficulties but once again the band showed that teamwork, a good work ethic and a desire to do well pays off leading to the them equaling their best ever result at the Scottish nationals. A special mention should also be made to the brave and talented soloists in the band who play with courage and musicality." Our thanks goes to John Hamilton for helping us out in the Bass Section and to the returning Jo Mabon on Euph. As we are sure you appreciate, running Jedforest Instrumental Band costs a great deal of money each year. To enable us to invest in its future and that of our many talented young players, we need to raise an average of £17,000 per year - a substantial amount of money. Much of this money goes to funding our tutors and musical directors, ensuring that your children get the very best tuition, free of charge, on their chosen instrument. We know how much you value this opportunity, particularly in today’s financially challenging times. With the money we raise, our young players can progress through the different band levels, finally becoming full playing members of the Jedforest Instrumental Band. Without the invaluable generosity and help of our loyal supporters, finding this money would be an almost impossible task. Many of you have kindly offered donations in the past, so with this in mind, we have decided to introduce a new ‘Friends of Jedforest Instrumental Band’ scheme for 2013. A chance for one lucky ‘Friend’ to join the Band on stage at the Christmas Concert! In addition, if you are a taxpayer the government will add another 25% to your donation. The more you donate, the more “Gift Aid” we will receive. 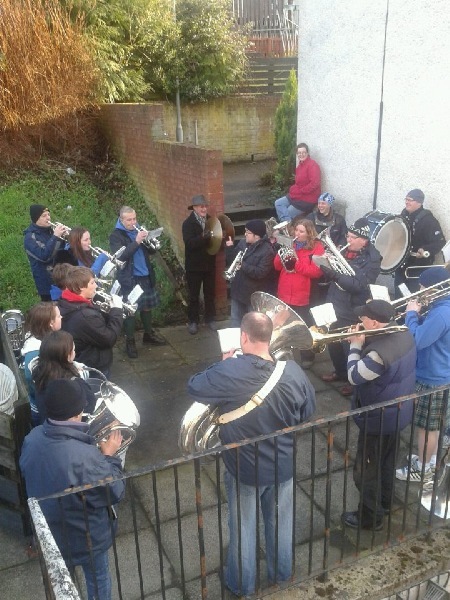 The band, once again took to the streets of Jedburgh on New Years morning to help the town celebrate the coming of another year. Starting at 9 am, the band paraded around the streets stopping only to take on board some fluids to aid the hard working players. After JIB's performance at last year Scottish Championships, the turn of the New Year brought the JIB promotion from the 3rd section up to the 2nd. This means the band will now compete in the 2nd section of this years championships and the piece the bands have been asked to play is The Plantagenates by Edward Gregson. This is a cracking piece and one that the band is looking forward to rehearsing over the next few months.